Hello to all! It is that time of the week where I do a little thing I call the Thursday Rundown. What will the five topics be tonight? Big Time Speech – This morning I delivered one of my more nerve-wracking public speaking engagements. 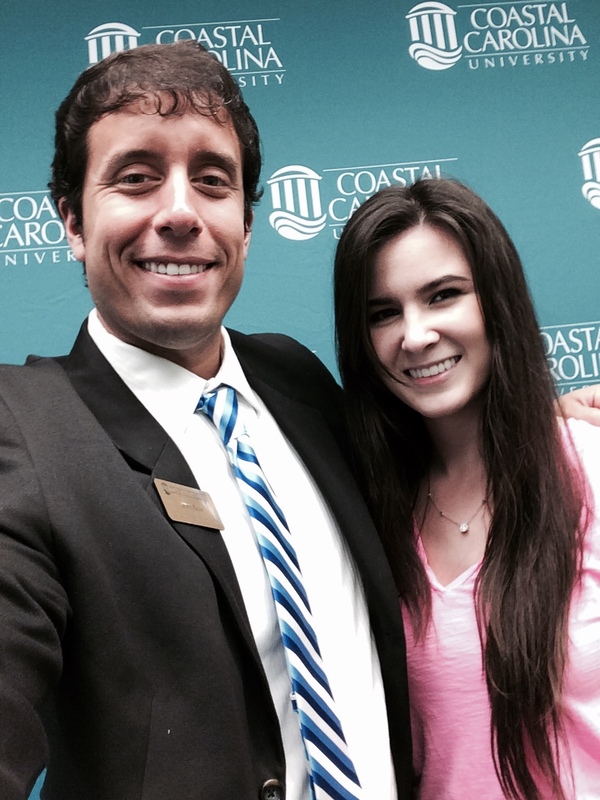 A couple weeks ago my boss asked me to present at the Board of Trustees meeting regarding our social media efforts. I definitely felt a little tentative speaking in front of such an important and polished group. However, the honor and possibilities of such an opportunity greatly outweighed my nerves. I drafted up my presentation, sweated it out rehearsing last night, and then delivered it at around 10:30 a.m. today. I had butterflies before I went to the podium but once I reached it they all went away. At the conclusion of my presentation when a member told me the Board had taken notice of my work and then they all recognized me with applause it was probably one of the prouder moments of my young career. 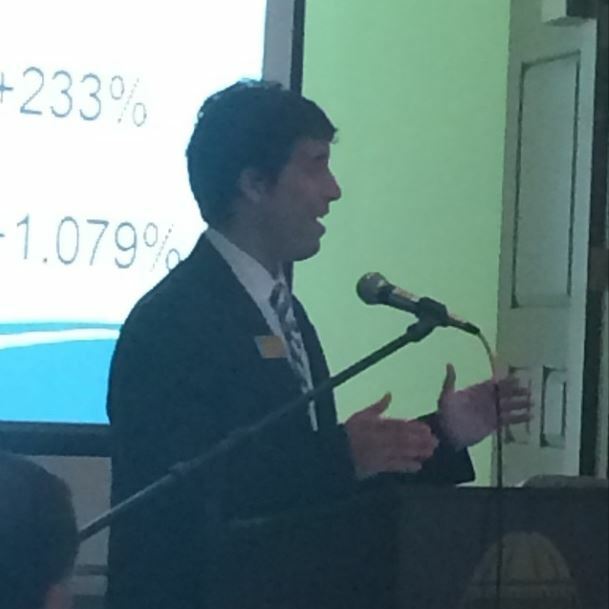 This was me speaking this morning at the Board of Trustees meeting at Coastal Carolina University. One Talented Student – Today one of our student-workers said goodbye to us. Alexandra Morris will graduate on Saturday and I am sad to see her go. Throughout my years working with students I don’t think I have encountered someone as talented as her. A wiz in both writing and video with a deep interest in filmmaking, Alexandra has the luxury to take her career wherever she wants to. She produces amazing work and I can’t wait to see where she ends up. I am going to miss Alexandra! Your Weekly Sean Carty Update – Coach Carty’s initial appeal has been presented to the principal at Mead High School and the waiting game has taken over. As the principal has five days to uphold or overturn, a decision should be coming soon. Although this level of the appeals process was never considered Carty’s strongest chance of getting it overturned (it was the principal who made the initial decision), there is always the chance. In fact, the belief is growing that the principal might just do what is right and overturn his original decision to help the district avoid further embarrassment. Mother’s Day – This upcoming Sunday is Mother’s Day. Remember to celebrate your mom and make her feel special. Also, it is never against the rules to celebrate other moms as well. Someone taking full advantage of this is Sidney. She took the time to create a silhouette of each of her students and then displayed it in an elegant way on colored paper. The kids have a spot to write a short personal message to their mom. What a thoughtful thing to do on the part of Miss Mathis! 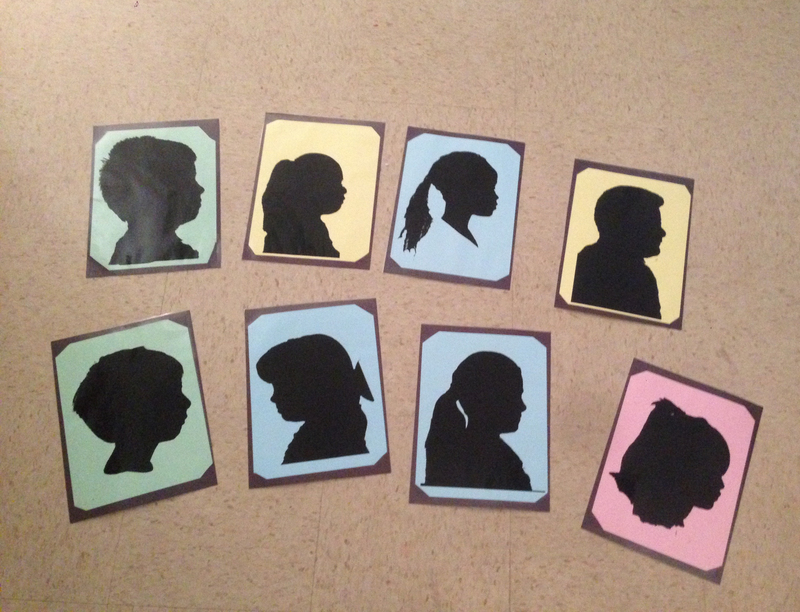 These are the super cool silhouettes that Sidney created for her students to give their moms. Ice Cream Mountain – At the end of the semester, Coastal hosts an event called Finals Frenzy. Our main dining hall opens up at 10 p.m. and welcomes study-deprived students inside to enjoy free food and prizes. 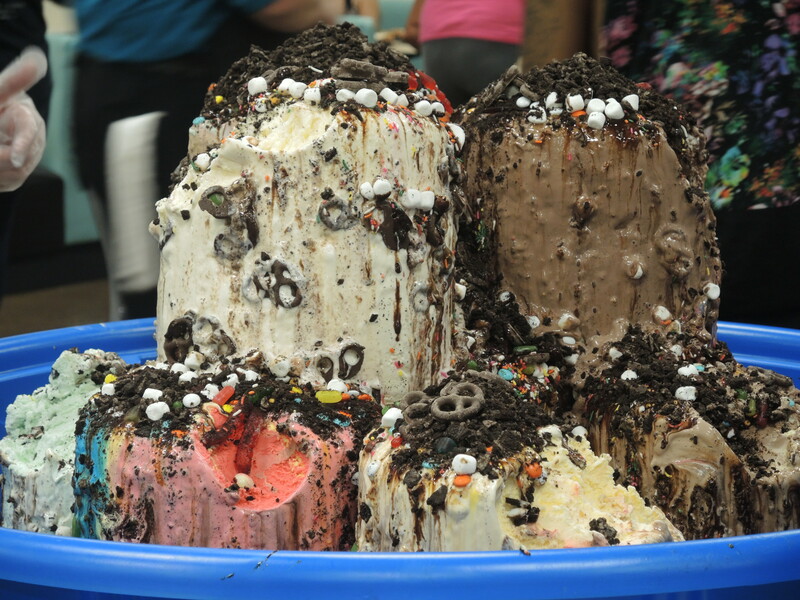 Each year, a gigantic mountain of ice cream is created for students to indulge in. The thing is so huge that they have to prepare it in a kiddie swimming pool! Anyway, because of my love for ice cream, I must share a photo I took of it right before the first scoop was taken out. This ice cream mountain is incredible! Now this isn’t something I could do in five minutes. Busy, busy weekend for me with four commencement ceremonies to work. I hope you all have a great couple days and I will touch base with you on Sunday. Don’t Blink.